Since Thecus® has entered the enterprise level NAS market with the N12000 and the N16000; they proved that the reliability and stability already found within its existing line of NAS could be tailor made to service heavy storage and heavy demand businesses. And to better serve the needs of the diverse enterprise users, the N12000V and N16000V followed which offered a choice between more value and more power. As the technology evolves quickly, Thecus® is now proud to announce its new large business solution, the N12000PRO and N16000PRO. The new PRO series of 12 and 16-bay NAS comes with the fastest Intel® technology ever seen at Thecus®. The N16000PRO and the N12000PRO are equipped with the Xeon® E3-1275 processor that runs at 3.4 GHz. The quad-core processors are matched by 8GB of DDR3 RAM on both devices to make sure that the biggest commands fly through without an itch. And to make sure the full power of the processors is used, a 10GbE network card can be added to the available PCI-e slot and link aggregation can be used to make sure your network doesn’t slow you down. Brought on by the ThecusOS™ 5.0, users can now dynamically stack their NAS units for more capacities in a single volume; simply designate your N16000PRO or N12000PRO as a stack master and implement a 10GbE switch to connect additional target devices. Scalability is the key notion when it boils down to volume expansion. In fact, an amazingeighttarget devices can be intertwined for a massive volume of multi TB capacity when utilizing 10GbE switch. Daisy-chaining is the most innovative function to expand storage volume while keeping cost down. Up to four D16000 DAS can be added to your N16000PRO and N12000PRO for an additional 64 bays of storage. As a result, IT enterprises or consumers who utilize large amounts of storage can obtain massive expansion and save cost. Another perk about daisy-chaining is that transfer speeds are fast! Thanks to the SAS cables that are put-to-use to daisy-chain the DAS to the NAS. 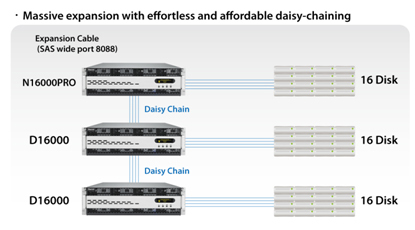 If paired with volume expansion, daisy-chain can help large businesses expand their storage capacity to up to 2.5 PB! 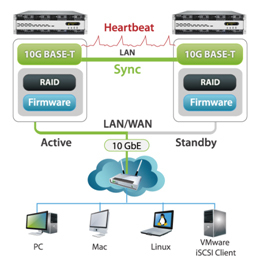 The N12000PRO and N16000PRO both run on ThecusOSTM5.0 which supports one of the most important features within the storage industry, High Availability.In short, HA allows users to replicate the data on an active NAS to another standby NAS via 10GbE synchronization. The importance of HA is quickly noticeable, whether there is data corruption or if the active NAS has any HDD problems or downtime, the standby server keeps all vital data saved and is available at all time to take over the active NAS’ responsibilities. Also supported by the N16000PRO and the N12000PRO is the total backup solution, Data Guard. This backup solution is the ultimate feature as it providesboth local and remote backup under one roof. Currently, data is backed up across RAID volumes, external USB drives, and eSATA. In addition, Data Guard uses innovative technology to sync data across the network to other NAS, take advantage of real-time remote replication to keep your data safe. More importantly, Thecus®Data Guard is the total backup solution which makes managing NAS user-friendly and convenient. Additionally, to cover enterprises backup needs, Thecus® joined hands with Acronis and gives five free registered copies of their Backup Recovery 10 Server for Windows. Acronis offers a wide range of critical features which includes scheduling and hot backups with password protection, advanced compression functionality to help save space, incremental backups to save time and FTP/SFTP remote backup. Windows Server users now have a seamless, practical and secure system disaster recovery solution with the features offer by Acronis Backup Recovery 10 Server for Windows (OEM). In a multiple users environment, it is easy to spread a virus or malware through the data stored on the NAS. Adding an antivirus to the already comprehensive software bundle will provide the necessary software protection by scanning the files on your NAS and defending it against possible threats. McAfee is the world’s largest dedicated security technology company and shares Thecus’ spirit of dedication and quality. By establishing a strong partnership with them, Thecus® allow users the benefit of McAfee’s powerful software on their NAS entirely for free. The N16000PRO and the N12000PRO from Thecus® are designed to meet the needs of large businesses with large amount of data and who expect professional performance out of their NAS. 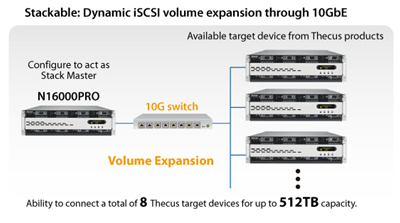 With unified storage, the users will have the ability to plug their NAS to an iSCSI network, and at the same time, use your Thecus® NAS as an IP Storage pool for both protocols. This way, the NAS can be compatible with any existing or future architecture. Now with faster processors, the N16000PRO and the N12000PRO will deliver quicker response time and handle multitasking with even better ease than before. The N16000PRO and the N12000PRO are a statement that Thecus® promises to always provide professional level NAS for all. For the first time, your data is completely free of delays in access. Regardless of the situation, HA actively keeps your data on two separate, identical NAS. If one needs maintenance, the other will dutifully rise to the occasion without as much as a blip in service. Whether rain, shine, or Armageddon, your data will always be there. High-end data centers often need a level of speed that today’s average Internet cannot provide. This Thecus NAS is 10Gb Ethernet ready to satisfy the toughest needs of today and tomorrow. Make your NAS into the ultimate multimedia hub! The N16000PRO’s HDMI output allows you to connect your NAS directly to your TV for device management. In the modern world, nothing is as important as reaching your data from anywhere. With T-OnTheGo and the T- Dashboard, you can manage your NAS, and upload to and download/stream from your NAS using an iOS or Android device on the go. Thecus NAS products are ready for a number of emerging technologies. Through the built in PCI-e slot, business users can add a 10G Ethernet Adaptor for lighting fast transfer speeds, or a USB 3.0 Adaptor Card to enjoy next-generation connectivity. User Interface Web-based user interface supports English, Traditional Chinese, Simplified Chinese, Japanese, Korean, French, German, Italian, Spanish, Russian, Polish, Portuguese, Turkish and Czech.